“How much does ___ cost?” is an apparently very interesting lens through which to judge countries – or more specifically, the obsessions of their (would-be) residents. 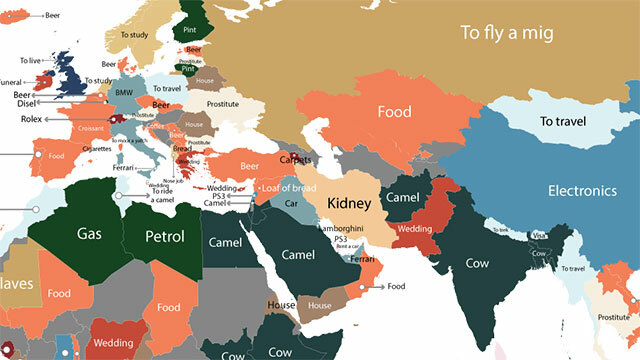 From “prostitutes” in Thailand, to “kidneys” in Iran, and even “slaves” in Mauritania, a new report published by Fixr.com compiles the most popular auto-completed searches on Google in relation to every country around the world. Using a simple Google search query, formatted as “how much does * cost in COUNTRY” the results were simply replicated and then collected into a spreadsheet. The results are indeed both intriguing and often hilarious. “Prostitutes” were an obsession for multiple countries including Brazil, Uruguay, Ukraine, Bulgaria, Hong Kong, Colombia, Latvia, and Thailand. “Beer” was a focus of several countries (esp. in Europe), while “camels” and “cows” were a stand-out in North Africa and Near East states. In South/Central America, common research included “funerals”, “coke” (undetermined which type), and “cost of living” while “Bic Macs” (Serbia), “divorces” (Trinidad and Tobago), and “honeymoons” (Maldives) took the cake in other places. Disclaimer: the report’s findings should not be considered scientific.